Brought to you by the soy checkoff. ©2018 United Soybean Board. Our Soy Checkoff and the Our Soy Checkoff mark are trademarks of United Soybean Board. All other trademarks are property of their respective owners. Secretary Dave Walton, Wilton | D6 Executive Committee Randy Miller, Lacona | D8 Board of Directors Brent Swart, Spencer | D1 Chuck White, Spencer | D1 April Hemmes, Hampton | D2 Casey Schlichting, Clear Lake | D2 Rick Juchems, Plainfield | D3 Suzanne Shirbroun, Farmersburg | D3 LaVerne Arndt, Sac City | D4 Jeff Frank, Auburn | D4 Rolland Schnell, Newton | D5 Morey Hill, Madrid | D5 Bill Shipley, Nodaway | D7 Jeff Jorgenson, Sidney | D7 Warren Bachman, Osceola | D8 Pat Swanson, Ottumwa | D9 Tom Adam, Harper | D9 Brent Renner, Klemme | At Large Stephanie Essick, Dickens | At Large American Soybean Association Board of Directors Morey Hill, Madrid Wayne Fredericks, Osage Brian Kemp, Sibley John Heisdorffer, Keota Dean Coleman, Humboldt United Soybean Board of Directors Delbert Christensen, Audubon Larry Marek, Riverside Tom Oswald, Cleghorn April Hemmes, Hampton Staff Credits Editor | Ann Clinton Communications Director | Aaron Putze, APR Senior Creative Manager | Ashton Boles Photographer | Joseph L. Murphy Staff Writer | Bethany Baratta Staff Writer | Carol Brown Staff Writer | Lauren Houska Staff Writer | Katie Johnson Sales Director | David Larson Iowa Soybean Review is published eight times a year by: Iowa Soybean Association 1255 SW Prairie Trail Parkway, Ankeny, Iowa 50023 (515) 251-8640 | iasoybeans.com E-mail: aclinton@iasoybeans.com For advertising information in the Iowa Soybean Review, please contact Larson Ent. LLC (515) 440-2810 or Dave@LarsonentLLC.com. Comments and statewide news articles should be sent to the above address. Advertising space reservations must be made by the first day of the month preceding publication. In consideration of the acceptance of the advertisement, the agency and the advertiser must, in respect of the contents of the advertisement, indemnify and save the publisher harmless against any expense arising from claims or actions against the publisher because of the publication of the content of the advertisement. Brick and mortar structures aren't often thought of as collaborative tools, but those working in the new Advanced Teaching and Research Building would say otherwise. A public-private partnership success story for water quality. A 4-inch rain in 60 minutes made a Corning farmer a believer in cover crops. Cruise ships, ocean liners, barges and cargo ships pass through the bustling Panama Canal in early February. 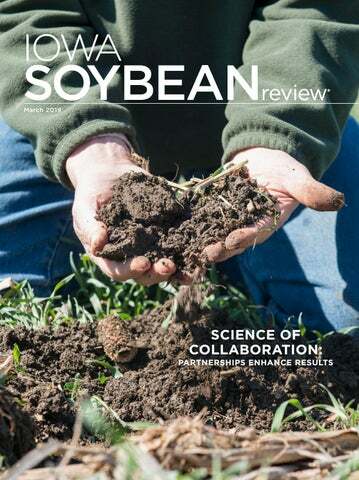 On the Cover: The Iowa Soybean Association has long recognized that given the range and scope of challenges in Iowa agriculture, collaborating and partnering with others is critically important. Rose Hill native and longtime conservation advocate, Mark Jackson, is pictured on the cover of this issue examining the nutrients of his farmâ&#x20AC;&#x2122;s soil. It takes a collaborative effort to enhance progress within the ag industry. a partnership between the United Soybean Board, American Soybean Association and 13 state soybean organizations, including Iowa. ISA played a critical role in creating this partnership to focus on the critical infrastructure and transportation needs of soybean farmers across the country. Mike Steenhoek serves as the Coalition’s executive director, and offices here at ISA. Additional stories share the value of partnerships as we work to increase demand for biodiesel, develop other international markets and build upon more than 50 years of collaboration with Iowa State University (ISU) on soybean research. This partnership with ISU is highlighted as we share photos of ISA’s support of the new Advanced Teaching and Research Building on campus. ISA will continue to uphold our commitment to our core values, including collaboration and partnerships. It’s what the farmers we serve expect, and it’s what we hope of ourselves and our many partners. HERE’S HOW THE SOY CHECKOFF WORKS. The national soy checkoff was created as part of the 1990 Farm Bill. The Act & Order that created the soy checkoff requires that all soybean farmers pay into the soy checkoff at the first point of purchase. These funds are then used for promotion, research and education at both the state and national level. Half goes to the state checkoff for investment in areas that are a priority for that state. ROI TO THE FA RMER by 73 volunteer soybean farmers, the United Soybean Board * Led (USB) invests and leverages soy checkoff dollars to MAXIMIZE PROFIT OPPORTUNITIES for all U.S. soybean farmers. Half goes to the national checkoff for investment in USB’s* long-range strategic plan. I struggle with this response. Yes, access to programs and services is extremely important and valuable – a must-have within the agriculture industry. But with a new generation finding its footing and asking for more, we must also understand that folks are now joining for different reasons. Some join to obtain relevant and timely information. Some join for leadership opportunities. As a millennial myself, I have observed five key things that people my age are asking of an association. 1. TEACH ME. 2. LISTEN TO ME. 3. MENTOR ME. 4. ACKNOWLEDGE ME. 5. REWARD ME. “When I look at the dues for each of the organizations I belong, I always ask, “Am I getting value from this membership? And with the ISA Advocate Membership, I see that value.” District 6 ISA Director Dave Walton adds, “It’s important to understand that checkoff dollars can’t be used for policy or legislative work. It’s why joining as an advocate member is so vital. The backing of all advocate members amplifies my voice and strengthens our efforts in Iowa and Washington, D.C.” As Walton says, since the soybean checkoff cannot be used to influence policy, we rely strictly on industry support and Advocate Membership. These investments build on research, education and communications by empowering ISA’s work with elected officials, regulators and policymakers. Next month, we will walk through a specific example and explore how ISA’s Advocate Membership is working for you. Stop Waterhemp from Eating Into Your Soybean Profits with Long-lasting Linex 4L®. because that’s really the only way as an industry you can make a long-term business investment and decision,” Kimberley says. Previous biodiesel tax credits have shown to help grow the biofuels industry, especially in Iowa. An extension of the tax credits would ensure some certainty for the 11 blenders in the state that produced 365 million gallons of the biofuel last year, Kimberley says. “The certainty of the tax credits provides an incentive for biodiesel plants, marketers and petroleum distributors to invest in infrastructure so long-term the industry can be very, very price competitive against petroleum no matter what kind of incentives are out there,” Kimberley says. An application of long-lasting Linex 4L® pre-emergent herbicide from NovaSource delivers broad-spectrum control of late-breaking waterhemp and dozens of other tough grasses and broadleaf weeds. This year, consider the Group 7 mode of action of pre-emergent LINEX 4L for late-season waterhemp control. It’ll be there when you need it. Visit us at novasource.com or call 800-525-2803 for more information. NovaSource® and Linex® are registered trademarks of Tessenderlo Kerley, Inc. Pat. 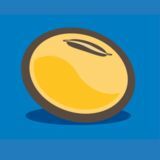 novasource.com. ©2018 Tessenderlo Kerley, Inc. All rights reserved. he role of the U.S. Secretary of Agriculture is to serve as a liaison between the President of the United States and the country’s farmers and ranchers. Sonny Perdue is ideally suited for it and he proved so again in keynote remarks delivered earlier this month at Commodity Classic in Orlando, Fla. Thousands of soybean, corn, sorghum and wheat farmers who gathered for the annual event granted Perdue a standing ovation as he outlined the administration’s focus and progress on agricultural trade. “Doing business with China is a priority for President Trump, and he has the back of America’s farmers,” says the former Georgia governor and state senator. “That said, we have a lot of work to do to come to an agreement. I’m hopeful that one is eminent, but I also don’t want to unfairly raise expectations. pain because of their productivity and dependency on exports. A scan of commodity sales data proves it. Since China’s implementation of a 25 percent tariff on U.S. soybeans last summer, exports of the legume to the country of 1.4 billion people have declined by almost twothirds. U.S. soybean prices are also off nearly $2 per bushel. “While there are a lot of hurdles and details to work out, we’re setting the foundation for the leaders of both countries to come to an agreement. China needs our stuff, and a resolution will be a bonanza for American agriculture,” Perdue says. As talks with China proceed, Perdue underscored the need for swift passage of the U.S.-MexicoCanada agreement, or USMCA. 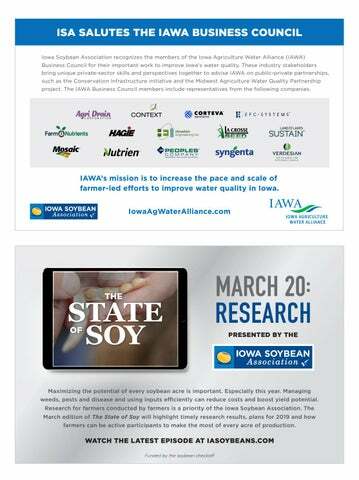 ISA SALUTES THE IAWA BUSINESS COUNCIL Iowa Soybean Association recognizes the members of the Iowa Agriculture Water Alliance (IAWA) Business Council for their important work to improve Iowaâ&#x20AC;&#x2122;s water quality. These industry stakeholders bring unique private-sector skills and perspectives together to advise IAWA on public-private partnerships, such as the Conservation Infrastructure initiative and the Midwest Agriculture Water Quality Partnership project. The IAWA Business Council members include representatives from the following companies. Maximizing the potential of every soybean acre is important. Especially this year. Managing weeds, pests and disease and using inputs efficiently can reduce costs and boost yield potential. 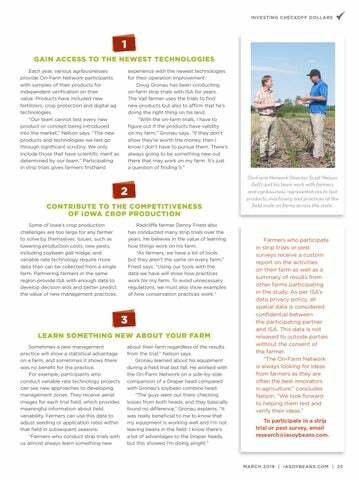 Research for farmers conducted by farmers is a priority of the Iowa Soybean Association. The March edition of The State of Soy will highlight timely research results, plans for 2019 and how farmers can be active participants to make the most of every acre of production. Sciences at the new ATRB. "The facilities offer many open spaces that encourage collaboration and communication," says Ed Anderson, ISA's senior director of research. "That helps drive all areas of science forward." In a partnership lasting more than 50 years, ISA has invested about $55 million in checkoff funds to champion research at ISU. 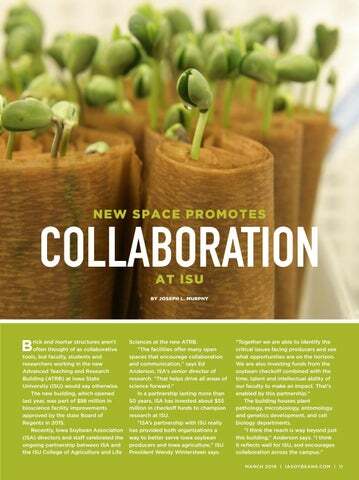 "ISAâ&#x20AC;&#x2122;s partnership with ISU really has provided both organizations a way to better serve Iowa soybean producers and Iowa agriculture," ISU President Wendy Wintersteen says. Insects displayed in the entomology department. ABOVE: InJung Kang, a visiting scholar, extracts DNA from plant tissue as Bridget Hatfield, a graduate assistant, performs an acyl-homoserine-lactone test. Building at Iowa State University boasts state-of-the-art research facilities and green house space on the roof. chemistry and toxicology, works on experiments relating to the synthesis of biorational insect repellents, the development of new potential nematicides and production of new compounds for seed treatments derived from natural products. Soybean plants thrive in an environmental room in the Advance Teaching and Research Building at Iowa State University. The plants are used to research varieties resistant to diseases and SCN. Secretary of Agriculture. 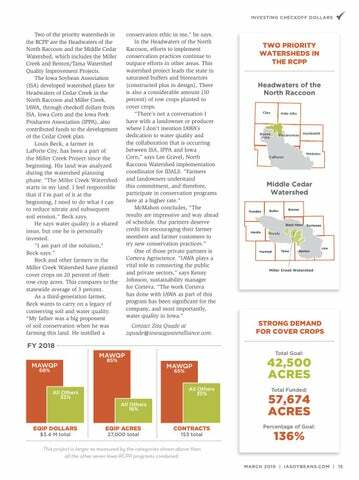 “The success of this project shows the strong interest and engagement by farmers and landowners in making measurable progress in achieving Iowa’s water quality goals.” The strongest demand for EQIP dollars has been for cost-share for cover crops. “There have been 57,674 acres funded through a combination of the EQIP funding and partner programs,” Jordahl says. conservation ethic in me,” he says. In the Headwaters of the North Raccoon, efforts to implement conservation practices continue to outpace efforts in other areas. This watershed project leads the state in saturated buffers and bioreactors (constructed plus in design). There is also a considerable amount (10 percent) of row crops planted to cover crops. “There’s not a conversation I have with a landowner or producer where I don’t mention IAWA’s dedication to water quality and the collaboration that is occurring between ISA, IPPA and Iowa Corn,” says Lee Gravel, North Raccoon Watershed implementation coordinator for IDALS. “Farmers and landowners understand this commitment, and therefore, participate in conservation programs here at a higher rate.” McMahon concludes, “The results are impressive and way ahead of schedule. 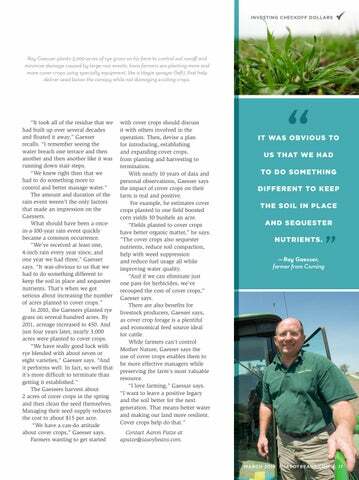 Our partners deserve credit for encouraging their farmer members and farmer customers to try new conservation practices.” One of those private partners is Corteva Agriscience. “IAWA plays a vital role in connecting the public and private sectors,” says Kenny Johnson, sustainability manager for Corteva. 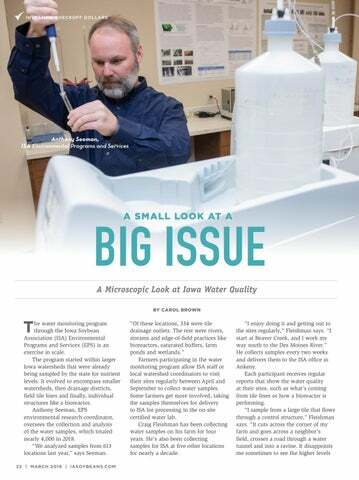 “The work Corteva has done with IAWA as part of this program has been significant for the company, and most importantly, water quality in Iowa.” Contact Zita Quade at zquade@iowaagwateralliance.com. industry leader and a 2018 candidate for Iowa’s secretary of agriculture, is an enthusiastic spokesperson for cover crops. When he and his wife Elaine began farming in 1978, so too, did their journey into conservation. They proceeded to make improvements to the land they farmed, including the installation of terraces and grassed waterways. 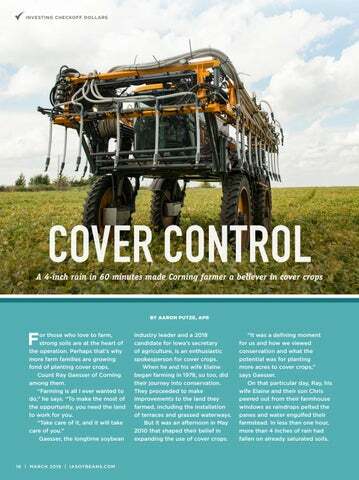 But it was an afternoon in May 2010 that shaped their belief in expanding the use of cover crops. “It was a defining moment for us and how we viewed conservation and what the potential was for planting more acres to cover crops,” says Gaesser. On that particular day, Ray, his wife Elaine and their son Chris peered out from their farmhouse windows as raindrops pelted the panes and water engulfed their farmstead. In less than one hour, more than 4 inches of rain had fallen on already saturated soils. Ray Gaesser plants 3,000 acres of rye grass on his farm to control soil runoﬀ and minimize damage caused by large rain events. Iowa farmers are planting more and more cover crops using specialty equipment, like a Hagie sprayer (left), that help deliver seed below the canopy while not damaging existing crops. candidates are calling into question their free trade agreement with the U.S. Deriving 30 percent of its gross domestic product from the Canal, Panama is one of many countries adversely impacted by a lack of trade. As U.S. soybean farmers know, trade is a backbone of their bottom line. Trade agreements with other countries remain imperative as the soybean market struggles to gain back the $2-per-bushel decline from the last 12 months of Chinese trade tensions. 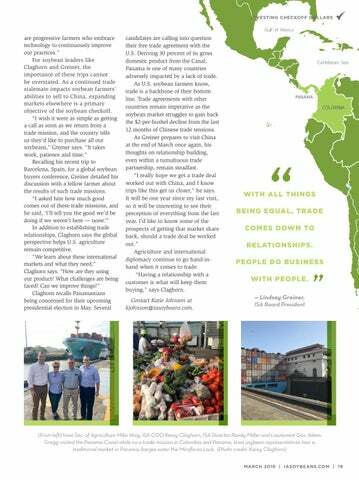 As Greiner prepares to visit China at the end of March once again, his thoughts on relationship building, even within a tumultuous trade partnership, remain steadfast. “I really hope we get a trade deal worked out with China, and I know trips like this get us closer,” he says. It will be one year since my last visit, so it will be interesting to see their perception of everything from the last year. I’d like to know some of the prospects of getting that market share back, should a trade deal be worked out.” Agriculture and international diplomacy continue to go hand-inhand when it comes to trade. “Having a relationship with a customer is what will keep them buying,” says Claghorn. Contact Katie Johnson at kjohnson@iasoybeans.com. Conceptual image of containerized shipping on the Mississippi River. consume the meal produced from soybeans? Is it the consumer, whether in the U.S. or another country, who purchases meat? One of the reasons this basic question produces such a variety of answers from farmers is because of having a supply chain designed and created to involve multiple steps of consolidation and aggregation. As Iowa soybeans journey from the farm to elevator to the rail or barge loading facility to export terminal, a number of degrees of separation emerge between the farmer and the ultimate consumer. Overall, this supply chain has served U.S. farmers well. 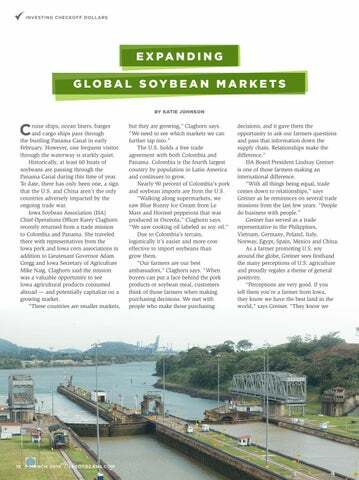 Billions of bushels of soybeans and grain are transported significant distances in a cost-effective, reliable manner. Our efficient transportation process remains one of the key global competitive advantages for U.S. soybean farmers. While the current supply chain — designed to transport soybeans and grain in bulk quantities — must be maintained and enhanced, an increasingly attractive complement to this model is transporting soybeans and other agricultural products via shipping containers. transportation to Mississippi Gulf export terminals. The research concluded that transporting soybeans from St. Louis via bulk barge to an ocean vessel at a Mississippi Gulf export terminal and onto a customer in Shanghai, China, would cost $79.80 per metric ton. Loading soybeans into a container near St. Louis, transporting it via rail to the West Coast and finally an ocean vessel journey to Shanghai would cost $140.33 per metric ton. 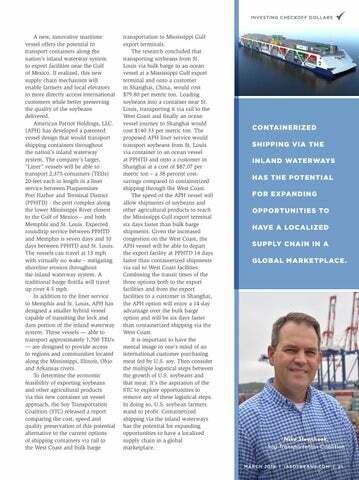 The proposed APH liner service would transport soybeans from St. Louis via container to an ocean vessel at PPHTD and onto a customer in Shanghai at a cost of $87.07 per metric ton – a 38 percent costsavings compared to containerized shipping through the West Coast. The speed of the APH vessel will allow shipments of soybeans and other agricultural products to reach the Mississippi Gulf export terminal six days faster than bulk barge shipments. Given the increased congestion on the West Coast, the APH vessel will be able to depart the export facility at PPHTD 14 days faster than containerized shipments via rail to West Coast facilities. Combining the transit times of the three options both to the export facilities and from the export facilities to a customer in Shanghai, the APH option will enjoy a 14-day advantage over the bulk barge option and will be six days faster than containerized shipping via the West Coast. It is important to have the mental image in one’s mind of an international customer purchasing meat fed by U.S. soy. Then consider the multiple logistical steps between the growth of U.S. soybeans and that meat. It’s the aspiration of the STC to explore opportunities to remove any of these logistical steps. In doing so, U.S. soybean farmers stand to profit. Containerized shipping via the inland waterways has the potential for expanding opportunities to have a localized supply chain in a global marketplace. 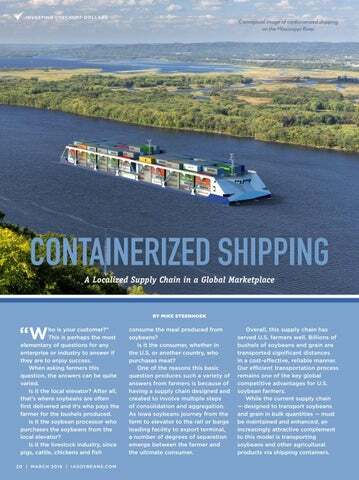 CONTAINERIZED SHIPPING VIA THE INLAND WATERWAYS HAS THE POTENTIAL FOR EXPANDING OPPORTUNITIES TO HAVE A LOCALIZED SUPPLY CHAIN IN A GLOBAL MARKETPLACE. he water monitoring program through the Iowa Soybean Association (ISA) Environmental Programs and Services (EPS) is an exercise in scale. The program started within larger Iowa watersheds that were already being sampled by the state for nutrient levels. It evolved to encompass smaller watersheds, then drainage districts, field tile lines and finally, individual structures like a bioreactor. Anthony Seeman, EPS environmental research coordinator, oversees the collection and analysis of the water samples, which totaled nearly 4,000 in 2018. “We analyzed samples from 613 locations last year,” says Seeman. “Of these locations, 334 were tile drainage outlets. The rest were rivers, streams and edge-of-field practices like bioreactors, saturated buffers, farm ponds and wetlands.” Farmers participating in the water monitoring program allow ISA staff or local watershed coordinators to visit their sites regularly between April and September to collect water samples. Some farmers get more involved, taking the samples themselves for delivery to ISA for processing in the on-site certified water lab. Craig Fleishman has been collecting water samples on his farm for four years. He's also been collecting samples for ISA at five other locations for nearly a decade. coming from the tile drains, but it is seasonal.” He’s spoken with the landlord at one of the sites about installing a bioreactor or saturated buffer. There is interest to do something but, Fleishman says, it’s difficult for them to commit financially. affects nearby waterbodies. They can then make informed farm-level decisions for reducing nutrients in the water leaving their land. The ISA water monitoring program supports the Iowa Nutrient Reduction Strategy (INRS), which calls for a 45 percent reduction of nutrients in waters entering the Mississippi River. The strategy is an outcome from the Gulf of Mexico Hypoxia Task Force, which asked all states along the Mississippi River to create a plan for nitrogen and phosphorus reduction in waters coming to the Gulf. When the strategy was released in 2013, Iowa was only the second state to have a completed strategy. Contact Carol Brown at cbrown@iasoybeans.com. Left: (opposite page) Anthony Seeman, environmental research coordinator with the Iowa Soybean Association (ISA), prepares a water sample for testing in the association's certified water lab. 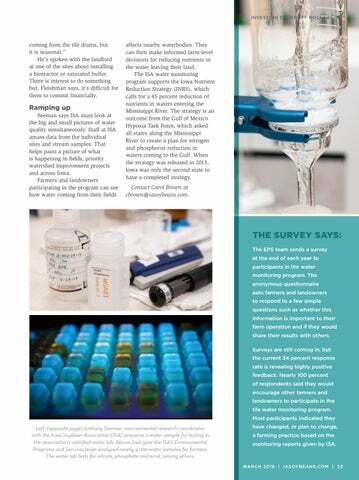 Above: Last year the ISA's Environmental Programs and Services team analyzed nearly 4,000 water samples for farmers. The water lab tests for nitrate, phosphate and ecoli, among others. have changed, or plan to change, a farming practice based on the monitoring reports given by ISA. ome farmers seem to have the upper hand when it comes to agricultural endeavors. Getting the upper hand mainly comes from experience or trial and error. Some farmers do both by participating with the Iowa Soybean Association’s (ISA) On-Farm Network® strip trials. In this space, farmers can try new products or practices to make sure they work with their operation before committing wholly. 2 CONTRIBUTE TO THE COMPETITIVENESS OF IOWA CROP PRODUCTION Some of Iowa’s crop production challenges are too large for any farmer to solve by themselves. Issues, such as lowering production costs, new pests, including soybean gall midge, and variable rate technology require more data than can be collected from a single farm. Partnering farmers in the same region provide ISA with enough data to develop decision aids and better predict the value of new management practices. On-Farm Network Director Scott Nelson (left) and his team work with farmers and agribusiness representatives to test products, machinery and practices at the field scale on farms across the state. provide information that will enhance your competitive edge. However, due to the nature of magazine production, deadlines happen way before we know what actual field conditions are going to be like. Mix in a trade war, and sometimes I feel like we are running in circles. But as experience has taught me, trusting the process is the best approach we can take. My friends, I hope you are all ready for a successful season and that you can enjoy the calm before the storm. May you plant the field you’re in. P.S. I am seeking a little reader help, please. I’m looking for some unique human interest stories. 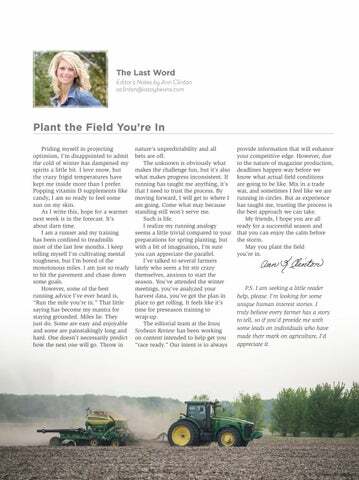 I truly believe every farmer has a story to tell, so if you’d provide me with some leads on individuals who have made their mark on agriculture, I’d appreciate it. AGRICULTURE IS A TOUGH BUSINESS. YOUR LENDER SHOULD BE, TOO. WE KNOW ALL ABOUT ECONOMIC CYCLES IN AGRICULTURE. Thatâ&#x20AC;&#x2122;s why we deliver financial strength and capacity to help you grow, attractive rates to give you an edge and cash-back dividends that give you something more. All delivered by people who understand your business like no other. Call 800-884-FARM. Iowa Soybean Review Editor Ann Clinton shares her thoughts on trusting the processes in her editor's notes. 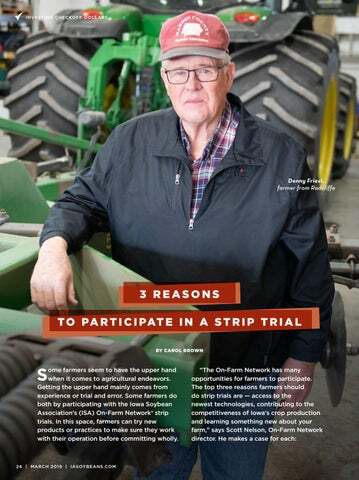 Farmers participating with the Iowa Soybean Association’s (ISA) On-Farm Network® strip trials try new products or practices to make sure they work with their operation before committing wholly. A microscopic look at Iowa water quality. “Who is your customer?” This is perhaps the most elementary of questions for any enterprise or industry to answer if they are to enjoy success. When asking farmers this question, the answers can be quite varied. ISA's Karey Claghorn recently returned from a trade mission to Colombia and Panama, traveling with other Iowa ag representatives. Learn more about how the mission was a valuable opportunity to potentially capitalize on a growing market. For those who love to farm, strong soils are at the heart of the operation. Perhaps that’s why more farm families are growing fond of planting cover crops. Count Ray Gaesser of Corning among them. 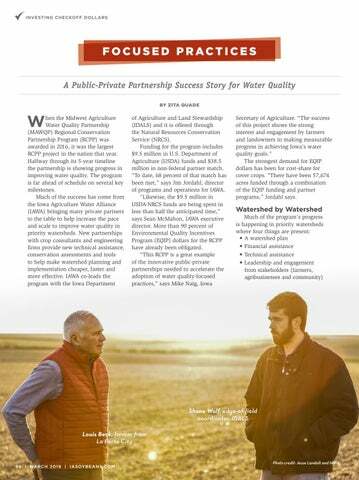 When the Midwest Agriculture Water Quality Partnership (MAWQP) Regional Conservation Partnership Program (RCPP) was awarded in 2016, it was the largest RCPP project in the nation that year. Halfway through its 5-year timeline the partnership is showing progress in improving water quality. The program is far ahead of schedule on several key milestones. Brick and mortar structures aren't often thought of as collaborative tools, but faculty, students and researchers working in the new Advanced Teaching and Research Building (ATRB) at Iowa State University (ISU) would say otherwise. 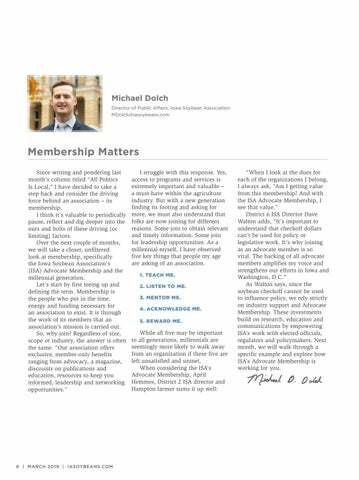 Iowa Soybean Association Director of Public Affairs Michael Dolch stresses the importance of membership in his monthly column. Iowa Soybean Association CEO Kirk Leeds shares his thoughts on collaboration and partnership in his monthly column.